State Of Emergency After Measles Outbreak In New York Suburb Rockland County declared a state of emergency after more than 150 people contracted the virus in recent months. 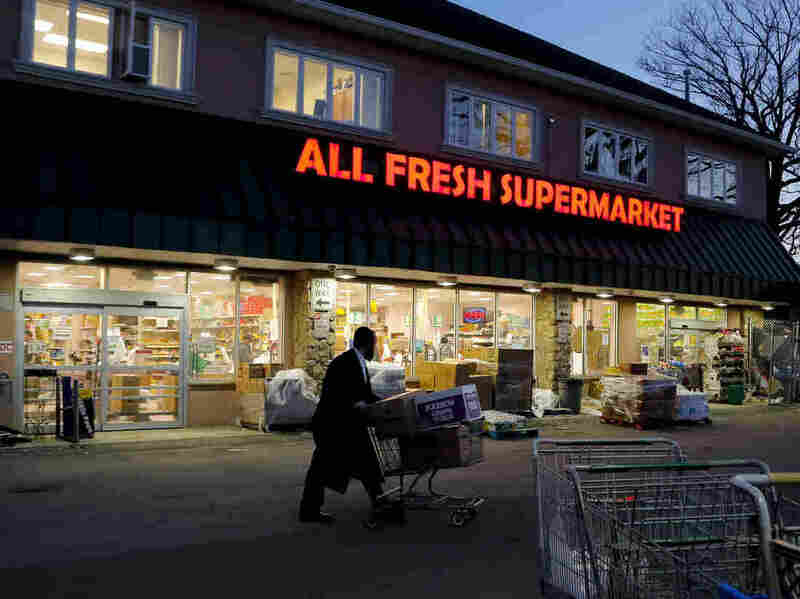 A man walks through the parking lot of a supermarket in New York's Rockland County, which has declared a state of emergency over a measles outbreak. Of course, there's no practical way to enforce the measure. But that's not exactly the point, anyway, says Rockland County Executive Ed Day. Officials just want to make sure parents know how serious things are in Rockland. There have been more than 150 confirmed cases of measles in the county since the fall, officials say. "It's an attention-grabber, there's no question about it," Day said at a news conference. The goal isn't to make arrests, but to bring attention to the issue, he said. Of the 153 confirmed cases as of Tuesday, 82 percent had not gotten the measles mumps rubella vaccine, according to county statistics. Most of those infected are minors. The emergency declaration bans unvaccinated minors from public gathering places, including restaurants, civic centers, houses of worship, shopping malls and schools. "I must take this step to protect the infants, infirm, and ill of this County who are unable to be vaccinated against the measles or who are immunocompromised," Day said in the declaration. "I must make every effort to protect them." The outbreak is more widespread in the Orthodox Jewish community, which has a lower rate of vaccination, Day said. The county has been working with rabbis in the area where most of the cases are occurring. "They have been supportive of what we've been trying to do," Day said. "If I did it three months ago, I'd be told I was overreacting; if I do it three months from now, I'd be told I'm taking my time," Day said of his decision to declare a state of emergency now. Early on in the outbreak, county residents were more receptive to getting vaccinated. "We're now seeing pockets of resistance." A county official told CNN that the outbreak in Rockland County is in its 26th week. During the outbreak, more than 17,000 vaccinations have been given in the county, according to CNN. Measles was declared eliminated from the United States in 2000. According to the Centers for Disease Control and Prevention, 91.5 percent of children in the U.S. were vaccinated against MMR in 2017.